Ernst Moritz Arndt (1769-1860) belongs to a generation, which changed the meaning of key terms of political thinking and modern culture so substantially that they continue to have an effect today. He played a public and influential role in this process, a homo politicus and intellectual, whose work continues to challenge readers to intensive contemplation of terms such as history, literature, nation, justice, education and faith. His perception of State, nation, the individual, public political participation and individual freedom is fed from the fundamental ideas of the Enlightenment of the 18 th and early Romanticism of the 19 th Century. His work is partly inspired by thinkers with opposing opinions such as Rousseau, Herder, the Schlegels or Fichte. He criticises the cultural and political dominance of France in Europe, which was radicalised as a result of Napoleon’s imperial politics. He demands indivisible individual and civil freedom and human rights. He also develops the idea of national unity with a generally respected diversity, which, according to Arndt, could be consolidated and retained by emphasising cultural and linguistic attributes. In his opinion, these were endangered by an indifferent “egalitarian” cosmopolitism, which he answered with ethnic segregation scenarios. At a time when people were still arguing about who and what actually defined the German nation, Arndt and others believed that nations were defined above all by language and lineage and that they had to be preserved in their pure state. Jews should not receive civil equality in Germany. Arndt was derogatory towards non- European ethnic groups in the context of contemporary race theories. These ideas are most definitely a thing of the past, others had their time, some are still current, like the ideas of Romanticism and Enlightenment which influenced our culture. The many different ways in which these ideas were received by Germans in the Imperial Era, the Weimar Republic, National Socialism and during the period of divided Germany (after WWII) is the starting point for the many controversies of Arndt’s works still today. 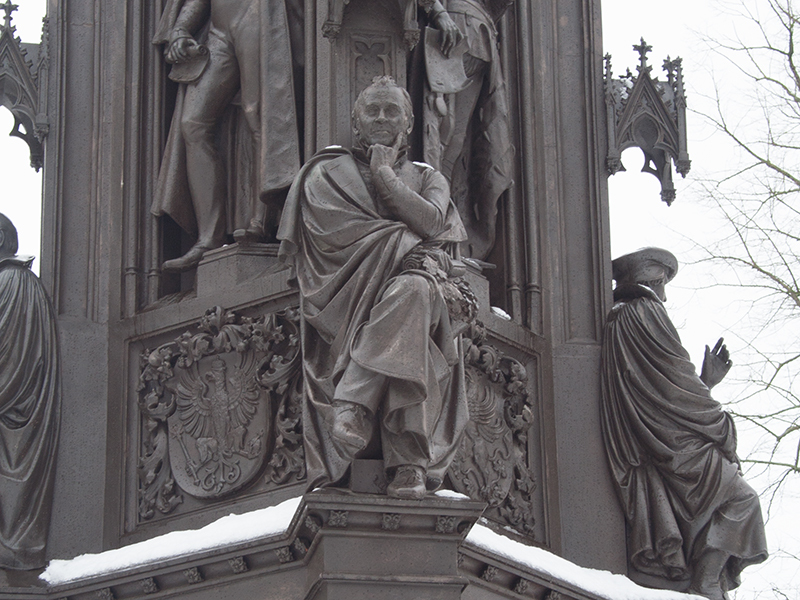 The University honoured Arndt, whilst still alive (1856), as the representative of the Faculty of Arts and Humanities in the sculptures of the Rubenow Memorial, due to his achievements as a publicist. In 1933, on initiative from the “Stahlhelm - Bund der Frontsoldaten”, the Senate asked the Prussian State Government if the University could carry Arndt’s name. Without doubt, the nationalistic motive was the decisive factor for this step. In 1954, the name was reinstated officially to the University’s title as a symbol of national unity and progressive heritage in the period of divided Germany.